I'm trying to come up with a graphic for this series... but it hasn't come to me yet. So until I figure it out - bare with me on the lack of graphic. My concept here is that I'd like to start letting ya'll in on a few of the things that I am using all the time in my house... both for the kids and not. There certainly are a lot of new products that I'm using for the boys - but we adults have things that are near and dear to us too that don't involve child rearing. 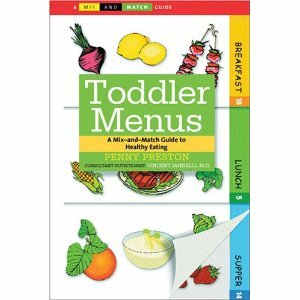 That being said, my first item that I'd like to talk about is a book called Toddler Menus. This book is fabulous, and has an interesting style. It is a flip system so you can mix and match the meals for yourself with the goal of getting in the 5 fruit/veggie servings that are recommended for each day. There are some cool recipes in there too - like Cheddar Bacon Muffins... and even things for my gluten free friends, I believe. Or I believe there are some easy modifications that could be made to fit it into your food plan. There are vegetarian selections too. There are 50 meal choices for breakfast, lunch, and dinner... so there is enough in here to keep the variety up for your kiddos. I've got three other toddler cookbooks - so I'll tell you about those another time too once I've had a chance to look at them more closely. 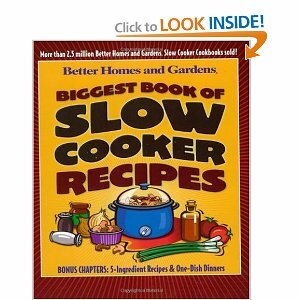 The Biggest Book of Slow Cooker Recipes - ya'll, I love books like this... because I tell you - I am a HUGE fan of my slow cooker. I've managed to put just about anything in it to make meal times work with nap times. For me the key is being able to put whatever we're eating together during a nap time so that it will be ready when I need it. I've done spaghetti sauce... which only gets you halfway there for dinner... but the meat is sooo tender - it's perfect for the littles who are learning to chew. I've also modified Jaime Deen's Chili recipe to make it in the crock pot as well. There are several recipes I want to try from this book when it gets a little cooler. I think with our new geography and a longer colder winter than we've ever experienced before - soups and stews are going to be the order of the season once it starts getting into the fall and winter. I'm actually pretty darn excited about that too. Do you guys have any "go to" cookbooks you want to share with me? I'd love to hear about them... I'm a total cookbook junkie. As for cookbooks, my favorite one (as of the last 5 years or so) is a Southern Living cookbook (attaching the link). No joke, everything in here is great. I think I've actually made about 20 or more recipes in there, and usually, I only cook a few things per cookbook. Buy it.